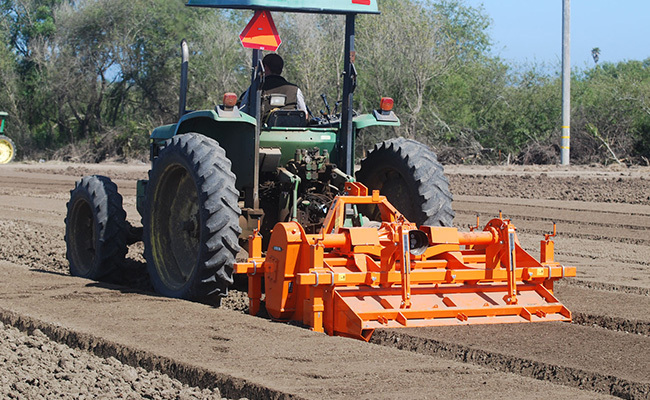 CultiMac is a highly specialized mulcher that forms perfect planting beds for your high density crop. One of the key components in a high density planting program is bed preparation. A very smooth, level bed top is essential for consistent harvest results. With a specialized dual rotor system, CultiMac forms very uniform beds ideal for high density crops. CultiMac features a specialized dual rotor system. The first rotor works to a depth of up to 7", and breaks down large clods. It is very similar to most mulchers, with large bolt-on blades that rotate in the direction of travel. The second rotor works to a depth of 2" and rotates in the opposite direction at a higher rate of speed. It utilizes small, welded tines which break down the soil even further. An optional powered rear roller finishes and forms near perfect beds for your high density crop. CultiMac's dual rotor shafts run in opposite directions resulting in uniform, optimal crumbling. CultiMac with optional rear roller (click pic to enlarge).